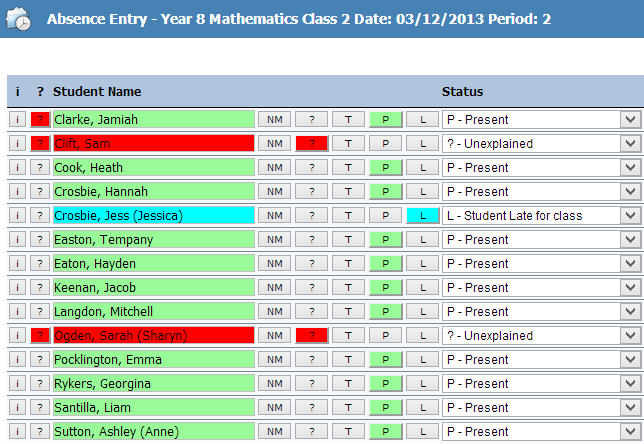 Roll marking by day or by period can be done from individual classrooms through the PCSchool 'Spider' Web interface. Ability to review and modify absences for each day/period over a specified date range. Fully integrated with bulk messaging web based service ensures better monitoring of absences incorporating automated early notification of caregivers. The ability to trigger automatic email alerts to subject teachers when rolls are not marked within a certain time and notify Deans / Attendance Officers of unexplained or consecutive absences. Graphical analysis identifies students who fall outside the norm. Produce reports based on Gender or Ethnicity. Extract attendance data for Government reporting including DEEWR Attendance Summary (Australia) and MOE Attendance Survey (New Zealand). Caregivers review student attendance and behaviour through the PCSchool 'Spider' Web interface enabling access to view instantly if their child has been marked present in class / school for the day. Quick links to Student Behaviour from Roll Marking to record discipline / uniform infringements or award merits for good work. Track accumulated points over time and print detention letters or awards based on points received.